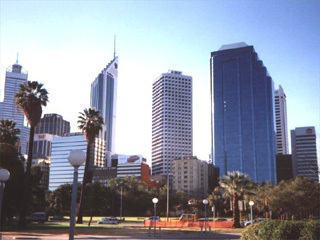 Perth is Western Australia's state capital. It offers much to the tourist in the form of beautiful beaches along the Indian Ocean shoreline and manmade as well as natural attractions further inland. Business visitors are likely to spend time in the Central Business District, located on the Swan River and alongside the purpose-built Perth Convention Exhibition Centre. Perth Cultural Centre is a central Perth district, home to the state's foremost art gallery and museum as well as the city's library and Institute of Contemporary Arts. Dining out is easy and good value, with a notable Asian influence to the cuisine. Rock Lobster (crayfish) is plentiful and cheap, and comes highly recommended. Transperth operates three free circular bus routes, stopping at many of the city's major tourist sites and shopping malls. These are easy to use, as information on the routes and the ETA of the next bus due is available on-screen at the bus stop itself. Perth Airport is located 5 miles outside the city and split into international and domestic terminals. The international terminal does not provide a public transport link to the city centre. Arrange a hotel transfer or rental car in advance or use the local taxi and shuttle services. We also have full city guides for Sydney, Melbourne, Brisbane, Canberra, Adelaide, and Cairns.